Created by our ancestors in the 18th century, our estate is in an exceptional location. The vines stretch over 27 hectares of beautiful gravelly rises with plenty of sunshine and a microclimate influenced by close proximity of the Gironde estuary. We attach a great deal of importance to traditional, quality-oriented methods in the vineyard, in much the same way as the great growths bordering on Chateau du Moulin Rouge. The vines are meticulously tended and the grapes are exclusively hand-picked. In 2015, the estate adopted the Bordeaux EMS (Environmental Management System) and obtained level 3 HEV (High Environmental Value) certification. The story of Château du Moulin Rouge is of one family’s passion for winegrowing. No fewer than 13 generations have worked hard to grow vines, to use the best possible winemaking methods, and to modernise the facilities. At the present time, two generations – parents and their children – add their personal contributions, ideas, and expertise to perpetuate the family heritage. Representing the 13th generation, Lucie Secret and Geoffrey Ribeiro elt it only normal to follow in their ancestors’ footsteps, taking over management of Château du Moulin Rouge and using traditional methods that had been perfected over the years. Each successive generation expanded the estate, and their diverse professional experiences led to improvements in winemaking and environmental protection. was born during the 1987 vintage. An agricultural engineer specialised in managing wine estates (with a degree from Bordeaux Science Agro), she also has an advanced vocational diploma in viticulture and oenology and a degree in wine law and wine sales. and a degree in wine law and wine sales. She is the estate’s technical manager and also in charge of administration. 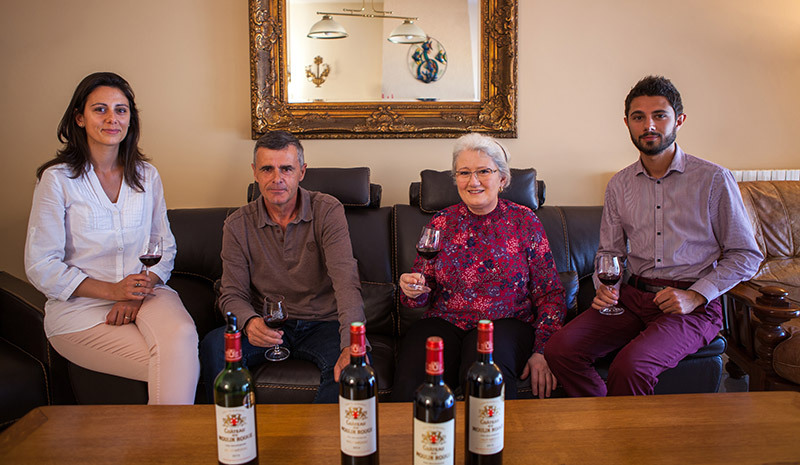 After working at several Médoc great growth châteaux and in South Africa, she felt the time had come for her to take over at the family estate, as well as to enlarge it, introduce a new grape variety, and commit to sustainable viticulture. She created her own cuvée in 2014: Château Beau Secret. was born during the 1992 vintage. Holder of a master’s degree in international trade, a degree in wine marketing and sales, and an advanced vocational diploma in viticulture and oenology. His professional experience includes working for a first growth, and he learned about logistics with a foreign importer. His aims for the family estate are clear: to ensure its continuity, to pursue the work of his ancestors by producing high-quality wines, and to promote sales of Château du Moulin Rouge around the world.